When Alan Cook was a boy in the 1940s, puppeteers enjoyed the status of current rock stars. They hosted early television shows such as “Howdy Doody” and were mainstays on the “Ed Sullivan Show.” Like many children of his era, Cook was given his first puppet, a Dutch Boy Marionette, as a Christmas gift by his parents. When he started school in South Pasadena, he joined the school puppet club. 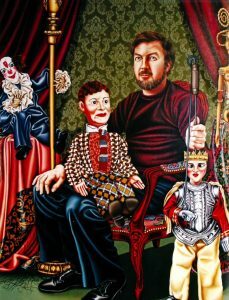 On weekends, his mother took him to puppet shows presented at the big downtown Los Angeles department stores, including Robinsons, Bullocks, and May Company. Ferdinand the Bull and Dopey, sold by Disney to promote their feature length cartoons, were among the first puppets Cook added to his collection. Walt Disney was an enthusiastic supporter of puppetry. Today, at 85, Cook’s puppet collection contains over 5,000 puppets and over 1,000 books and magazines on the art. Puppetry Arts Museum founder Nancy Lohman Staub described the collection as one of the largest, most important puppet collections in the country. But like puppetry itself, Cook’s collection, along with his encyclopedic knowledge of the art, was in danger of being lost. 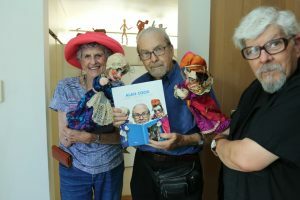 Fortunately, two years ago he and Hermosa Beach sculptor and fellow puppeteer Jacquelyne Marks committed themselves to finding a permanent home for Cook’s puppets and to publishing a book recounting Cook’s career in puppetry. The collection found a home at Northwest Puppet Center in Seattle.